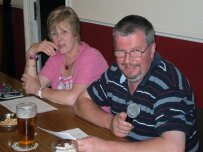 Presteigne St Andrews’ quiz lived up to the usual standard of good-natured bickering, puzzled expressions and head scratching as the 13 teams battled it out for the top honours. In truth, Norton United’s slightly changed squad was still nailed on favourites to defend their crown, but they would admit to having been given a major fright by the Exiles who pushed them all the way, finishing only one point behind. While there might have been fewer teams than in previous years, the quality of competition was arguably every bit as good as Tim Sanders’ questions sorted out the wheat from the chaff. In truth, the Exiles might well have caused a major upset by dethroning Norton United had they known the names of the Premier League and Football League clubs whose grounds lie within the M-25. The club would like to thank all those teams who supported us on the night as well as the committee members who sold draw tickets, ran the bar, shifted tables and chairs and who undertook other behind the scenes jobs. 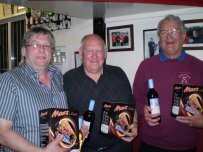 We would also like to thank those who donated prizes, both for the quiz and the draw – there were some cracking prizes which were very much appreciated by those who received them. In particular, we would like to thank Tim and Marion Sanders for all their hard work on the night – Tim for setting and asking the questions, and Marion for keeping the scores so efficiently, thereby ensuring there were no ‘stewards inquiries’. After extensive research – well, I looked it up on Google – I see that Maundy Thursday 2012 is scheduled for 5 April, so please stick that date in your diary now for next year’s event.